Interesting Book. 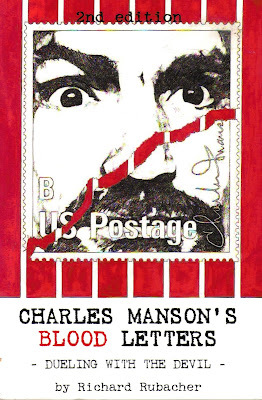 The text of it is only about 84 pages long, the rest being made up of the index, an excerpt of Manson being interviewed on Geraldo, a brief summary of the Manson Family, and about ten pages of photographs, most of which are the envelopes and pages of several letters from Manson to the author. While he was in college, Rubacher wrote to Manson after seeing him on Geraldo. 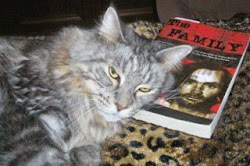 Eventually he told Charlie he wanted to write a book about him. He visited Manson in jail (Vacaville). That was the best part of the book. Charlie made R&R do a Hitler imitation before he would talk to him. When he complied, the guard ran in to see what was going on. After the visit, Manson sent Rubacher several boxes of the fan-mail & Family correspondence he'd been sent up till then (this was 1976). There was writing on some of them from Ed George who I assumed screened them. He thought Rubacher was a Family member. For some unknown reason, the two had a falling out. Charlie demanded the return of the letters. Rubacher refused. About this time, Manson sent recently released Dennis Rice to pay Rubacher a visit. I was kind of unsure about how this could be, since Rice was sent away for the Hawthorne shoot out. Having found no info on his release date from prison, I contacted “Sherlock” Deb S. She found an article that shows he only did 8 years. So knowing that, the time frame fits. Rice was sent to reclaim the letters, but Rubacher managed to get rid of him. After letting Charlie know his attempt failed, Manson replied that Rice is just a little guy trying to play “Mr. Big”. I thought Dennis Rice found God while he was in prison??? This was followed by a visit from a female only identified as “Hail Mary”. Could that have been Mother Mary Brunner??? After refusing to return the letters to her, the correspondence seems to have ceased between them. There are a few errors in the book, nothing too bad. He refers to Steve Parent as being the caretaker. Charlie’s letters show a lot of hatred in them. Especially to the Jews. 3. “Eater of the Secret.” Using the rituals of a shaman of a Native American tribe in Oregon, Manson rids people of their shame and guilt making them loyal subjects. 4. Fear as a Weapon. 5. Love as a Weapon. He charms with music, song an appears as a person who is smitten with loving kindness. 6. Mimicking a person’s verbal and non-verbal behaviors. 9. Intuition. He picks up vibes from a person’s aura. He is intuitive to a frightening degree. 10. With Manson, it’s play time. He has an uncanny way of bringing out the playfulness of a person, especially if the person is afflicted with “original sin”-falling into seriousness. Overall, not bad. Worth a read. Submitted by Grump. Thanks Grump! Thanks DebS for the Dennis Rice information... and Happy Belated Birthday! Always happy to do some research! Your welcome! And Thank You for the birthday wishes! I've passed on this book before but I just might have to get it now. I think Dennis "Fatherman" Rice died about 2 months ago of liver cancer, June 21, 2013. I think Rice was involved in a religious organization called "Free Indeed Ministries" in Tempe AZ. A bit of info about him can be found HERE. Also, I ran across what I think is another page from that MansonBackPorch site Kimchi linked to the other day. There are some old pix of Spahn I'd never seen before. I missed the Michael Channels live radio/tv interview, however, I just watched the video. With Michael Channels and Stoner Van Hauten!" It can be seen/heard HERE. It is not a YouTube vid so it may not work for everyone. The Michael Channels segments begin about the 14:30 mark of the vid.